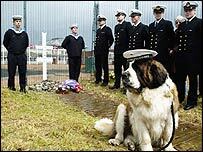 The Scottish town of Montrose has held a memorial ceremony for a four-legged WWII hero, Bamse the St Bernard, who died in 1944. Bamse the Norwegian sea dog is buried next to the town's GlaxoSmithKline factory and was honoured in a service on Sunday afternoon. He came to the town in 1942 with Royal Norwegian Navy captain Erling Hafto and became a symbol of freedom. On his death 60 years ago he was given a hero's funeral for his bravery. His reputation grew from his habits in battle whilst out at sea on his master's ship, the minesweeper Thorodd, based in Montrose during World War II. He would stand firm at the foremost gun tower of the boat until hostilities ended and eventually received the PDSA award for bravery for his actions. 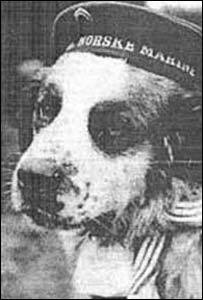 During his two years in the town, Bamse, who used to wear a Norwegian sailor's cap, he became something of a local institution. He was issued with his own bus permit, which hung around his neck, and would gather up any errant crew members from the local pubs. He even featured on Christmas and Easter cards at the time and became a symbol of freedom to the allied forces. Montrose Port Authority board member Henny King, who helped organise the ceremony, said: "We thought we must do something to celebrate his life because he was such a wonderful story and we thought it only right that we celebrate such a brave war hero. "He was known by everyone at the time and some of the town's older generation can still remember him. "After the summer we hope to start a fundraising campaign and raise enough money to build a life-size statue of him in a prominent position near the water. "Edinburgh has it's own tribute to Greyfriar's Bobby and there's no reason why Bamse can't become an equally prominent symbol for Montrose. "I would also like to write a book for children about Bamse's life and I would love to get local schools involved in the project." When Bamse died in July 1944 local schools closed and several hundred children attended his funeral. He was buried with his head facing his homeland of Norway. In 1984 and 1994, for his 40th and 50th anniversaries, a Norwegian naval crew arrived in Montrose to pay their respects at his graveside. On Sunday, Lieutenant Commander Oistein Jensen and 10 of his crew members from the Norwegian submarine Utvaer represented the force. They were joined by about 100 invited guests, including the daughter of Captain Hafto, Vigdis Hafto, who went with her family to pay their own respects.